Victor Marswell – or “this big Congo Casanova,” as Gardner’s Eloise “Honey Bear” Kelly derides him – is a refresh of Gable’s earlier role in Red Dust (1932), a steamy pre-Code drama centered on a love triangle between a rugged outdoorsman, a brassy painted lady, and an upper-crust married woman. In addition to recasting the roles of the female leads, Mogambo updated the setting from Red Dust‘s rubber plantation in French Indochina to an African safari. Eloise Kelly: A weird sort of business to be in, collecting animals. I guess it’s fun for a man, isn’t it? Victor Marswell: When it’s profitable. 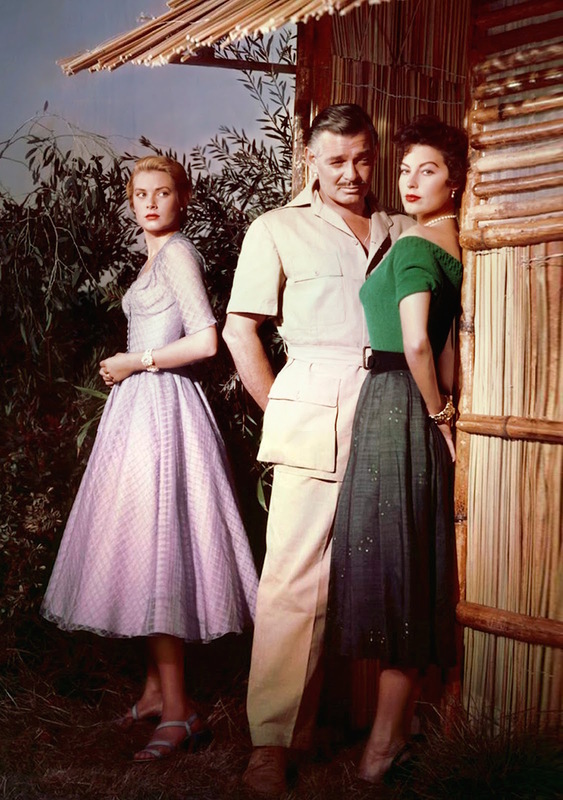 Though a hit among audiences and critics with Academy Award nominations for both Gardner and Kelly, Mogambo‘s production was fraught with its own behind-the-scenes drama, from Clark Gable protesting director John Ford’s treatment of Ava Gardner to Gable’s own far-too-friendly relations with the much younger Grace Kelly. 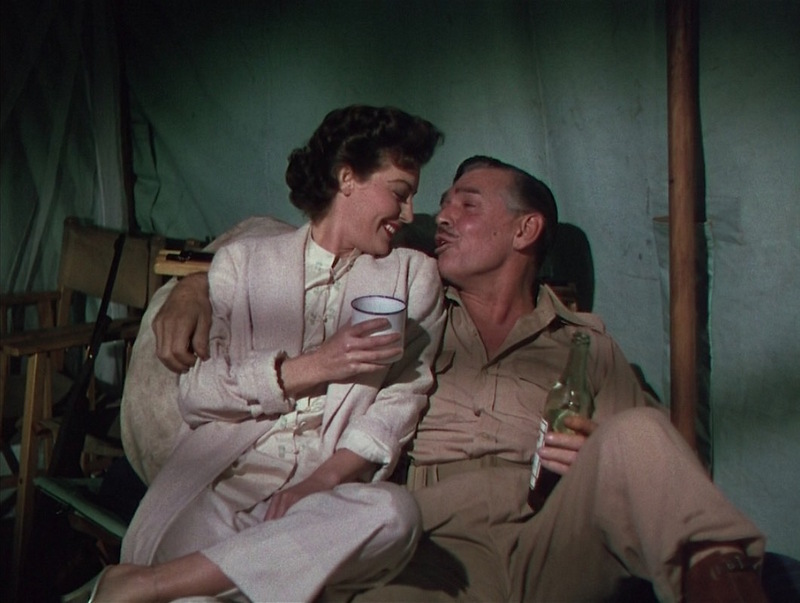 In fact, it was reportedly Gable’s fondness for hunting that kickstarted their affair, as Kelly would often accompany him on hunting trips during breaks in the production. “He was as masculine as any man I’ve ever known, and as much a little boy as a grown man could be,” Doris Day once described Gable. 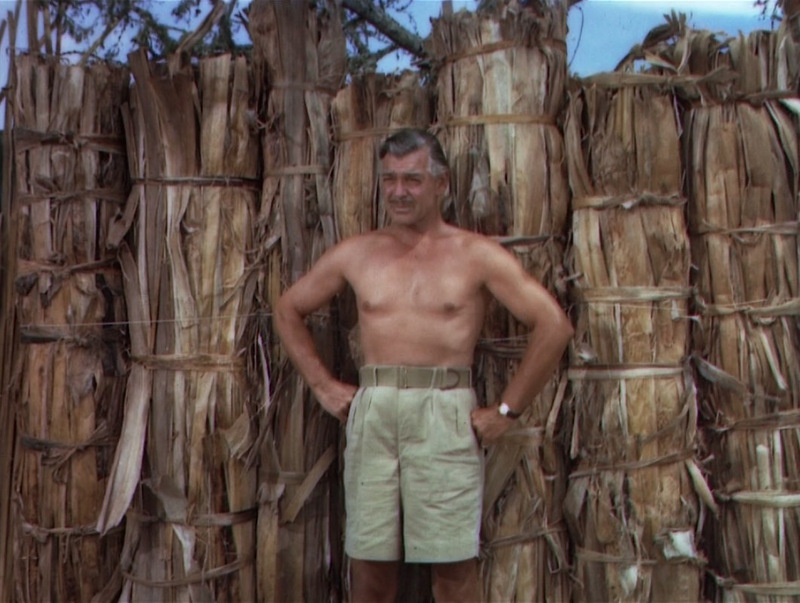 This idiosyncratic combination of masculinity and childish insecurity can be observed in stories from the production, such as Gable’s insistence on hirsute members of the crew or cast – including co-star Donald Sinden – having their torsos shaved clean so that they would not appear to be more “manly” than the bald-chested Gable. 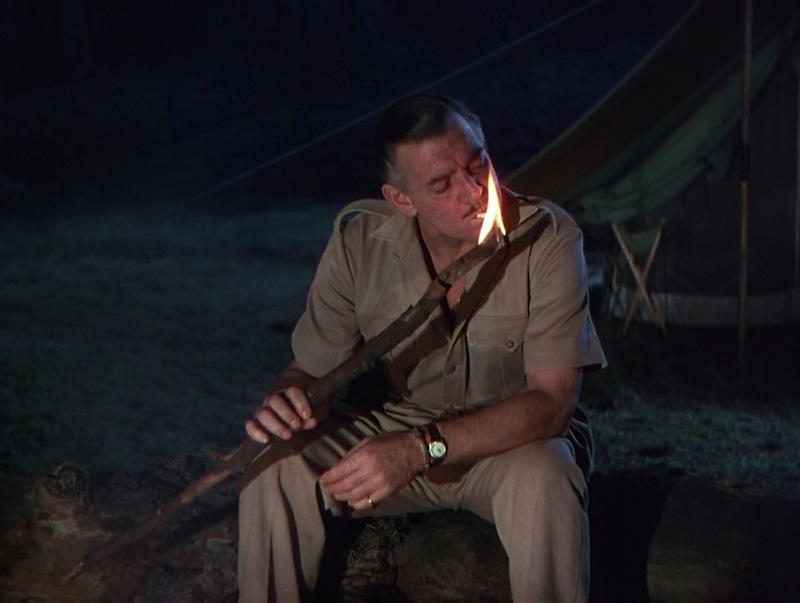 With moments like this, where Gable’s character lights a cigarette using the fiery end of a campfire stick, the actor had little reason to worry about losing his reputation for ruggedness. The ever-vivacious Ava Gardner, a year into her tumultuous marriage to the oft-visiting Frank Sinatra, managed to stay out of the rest of the cast and crew’s drama, instead creating her own… often for her own amusement. When the British colonial government complained of her habit of bathing on location with the assistant of young men from the local Watusi population, she shed her clothes and walked naked through the camp. Of course, the famously jealous Sinatra responded by gifting her a shower unit that Christmas. In his definitive menswear volume Dressing the Man, Alan Flusser defines the bush jacket, or safari jacket, as “a belted, single-breasted shirt jacket with four patch pockets and flaps in tan cotton drill or gabardine.” The safari jacket emerged as popular casual wear for civilians first in the 1930s before enjoying a revival again in the 1970s that found everyone from Roger Moore’s James Bond to Bob Newhart co-opting the look with varying degrees of success and enduring degrees of controversy. 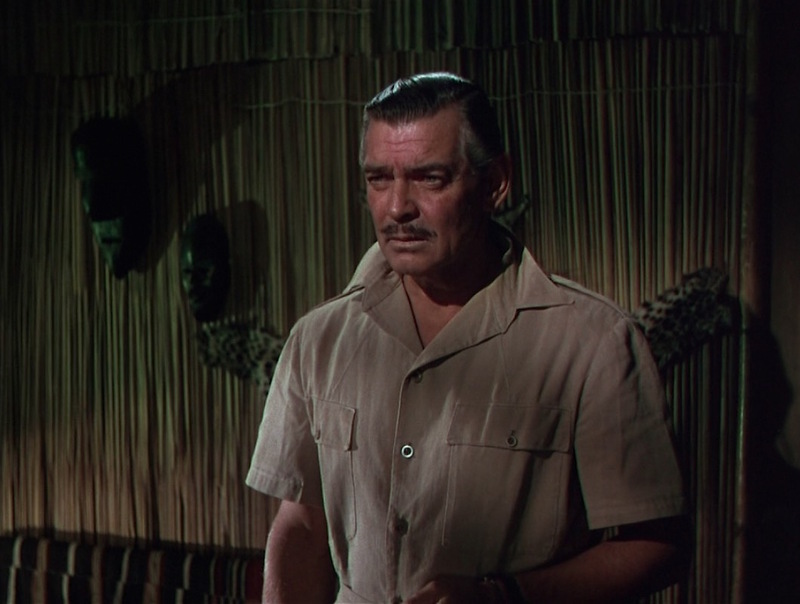 However, there can be no argument made against Clark Gable’s macho hunter sporting exclusively safari clothing when actually engaged on a safari, as worn in Mogambo (1953). 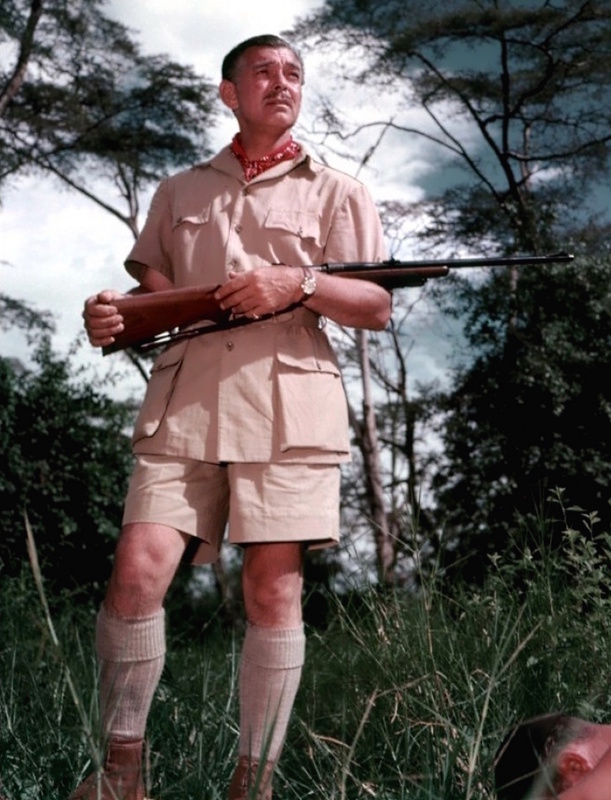 Gable’s safari wardrobe was tailored by H. Huntsman & Sons of Savile Row, and it was this experience that reportedly converted Gable into a Huntsman customer for the last decade of his life. 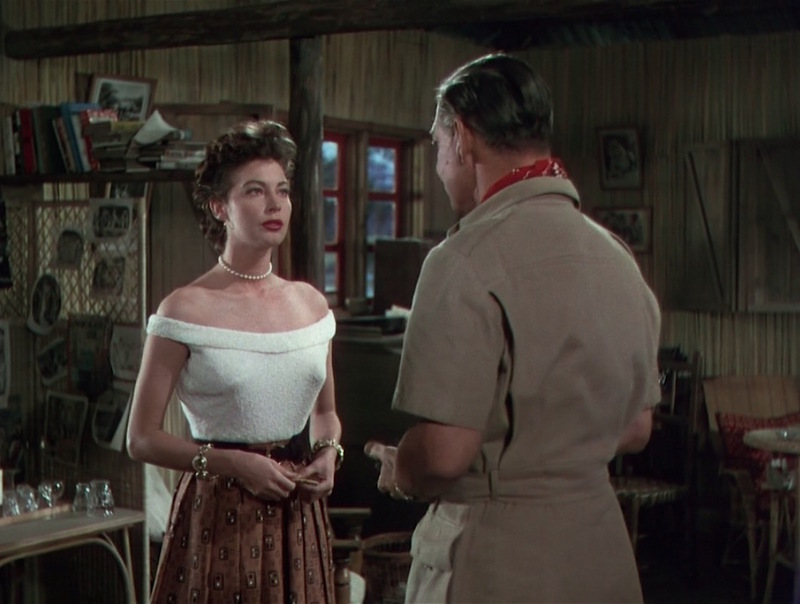 Then again, any tailor that would bring someone this close to Ava Gardner and Grace Kelly would probably earn my lifetime business as well. 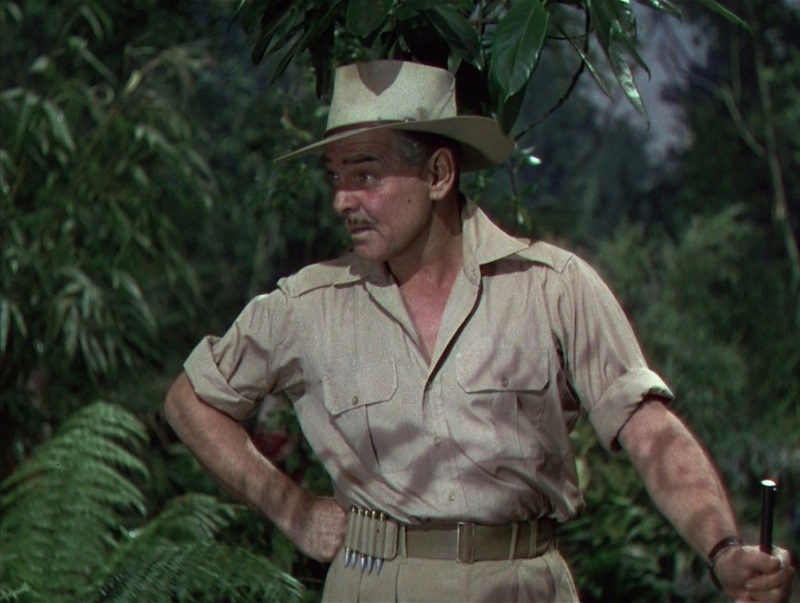 After wearing a navy polo shirt for his introduction both to the audience and to Eloise Kelly, Victor Marswell makes his first appearance in his character’s iconic safari clothing when giving Kelly a tour of the animals that he keeps around. For this tour and subsequent days on safari, he wears a tan cotton drill bush shirt with the long sleeves unbuttoned and rolled up to his elbows. 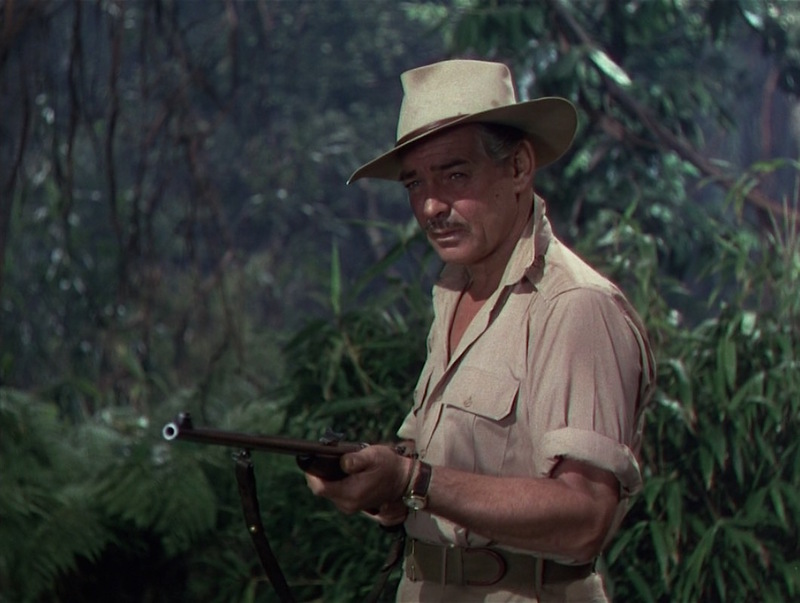 Victor on safari with his wide-brimmed hat, bush shirt, and belt equipped with a five-round ammo carrier. The shirt has a very wide-pointed collar, epaulettes (“shoulder straps”), and a front placket for the tan plastic sew-through buttons. There are two box-pleated chest pockets that each close with a mitred-corner, single-button flap. The perfect bush jacket for a rhino hunt. This gabardine bush jacket has a shorter collar than his shirt with distinctive shoulder yokes that extend diagonally from his heavy epaulettes buttoned at the neck. The box-pleated chest pockets have pointed single-button flaps, and the large bellows pockets below the belt have rectangular flaps that also each close with a single button. The jacket is self-belted with a double-prong brass buckle. Victor works his charm on a jilted Honey Bear. Victor Marswell’s more frequently seen bush jacket is a lighter-weight cotton drill that can be visually distinguished by the straight flaps on the chest pocket and a plain front with no placket for the five-button closure. Note the subtle differences between this and the heavier bush jacket seen above. This lighter cotton bush jacket is styled similarly to the other, with a short, shirt-style collar, diagonal yokes extending from under the epaulettes, and four patch pockets. However, the two chest pockets have straight single-button flaps. The bellows pockets below the belt also have straight flaps that each close with a single button. The self belt closes with a tall brass single-prong buckle. The “action back” is pleated on the sides under the shoulders, and there is a single vent. 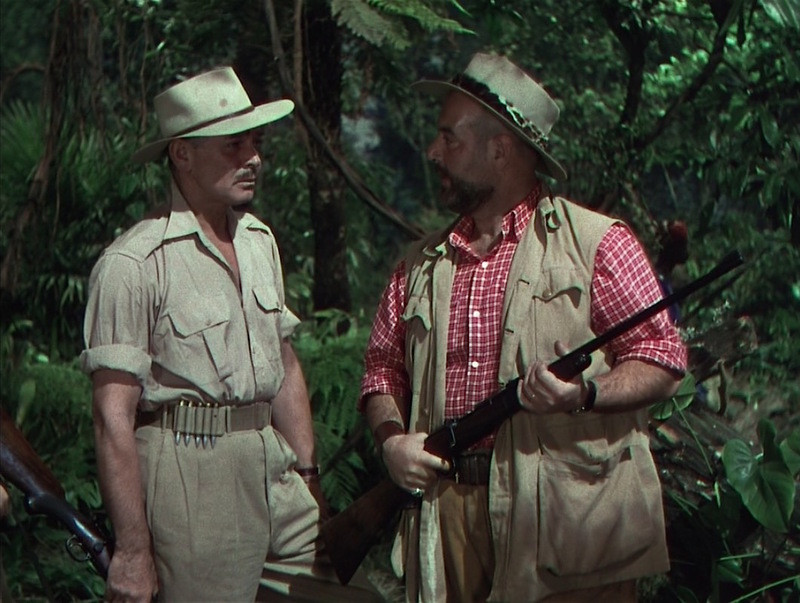 The “action back” pleats are helpful for someone on safari who may need to quickly move their arms to raise a rifle… or to speed up when running away from an angry panther. 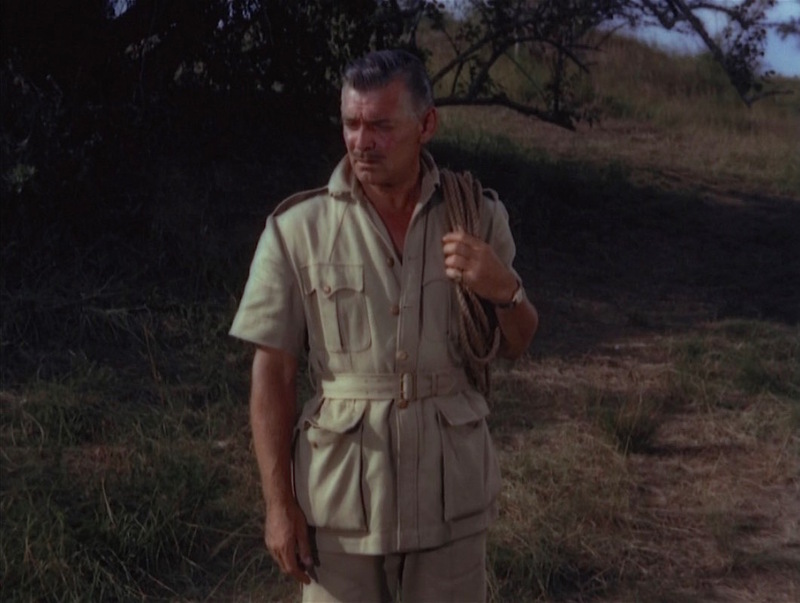 Victor typically wears these bush jackets on their own, rather than layered over shirts, but he does wear this one over his long-sleeved safari shirt – with both the jacket and shirt sleeves rolled up – at one point during the group’s adventure. 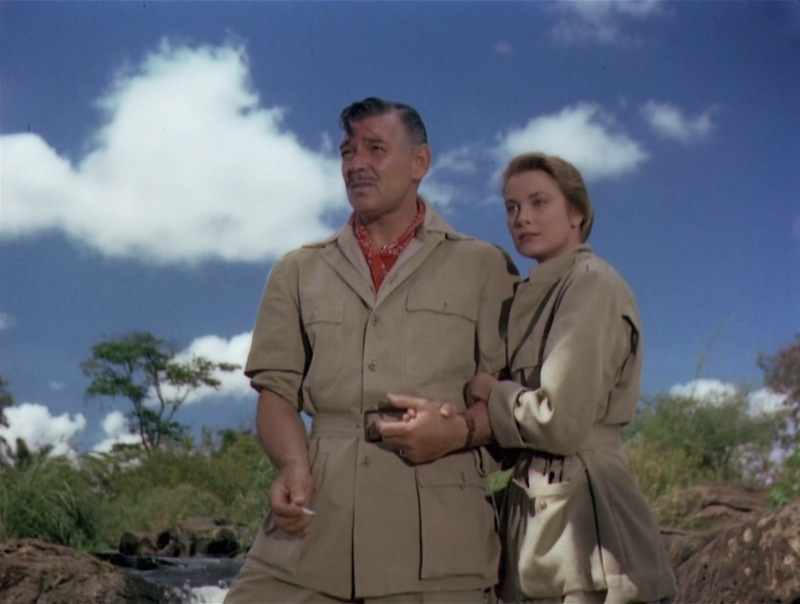 Life imitated art as Clark Gable and Grace Kelly reportedly began an affair after taking secluded hunting breaks during the production, much as their respective characters Victor Marswell and Linda Nordley took advantage of their seclusion from the rest of the safari to begin their romance. Occasionally, Victor wears a red paisley cotton bandanna around his neck. The pattern is a typical white-and-black paisley print on the bright red cotton ground. When Victor does layer over his shirt, he usually opts for the cooler-wearing option of a sleeveless safari-inspired vest. This long, thigh-length vest is styled like his shirt with a large collar, epaulettes, and four patch pockets. The two large patch pockets on the chest have straight, single-button flaps, as do the two very large bellows pockets below the waist where he keeps his Camel cigarettes and lighter. 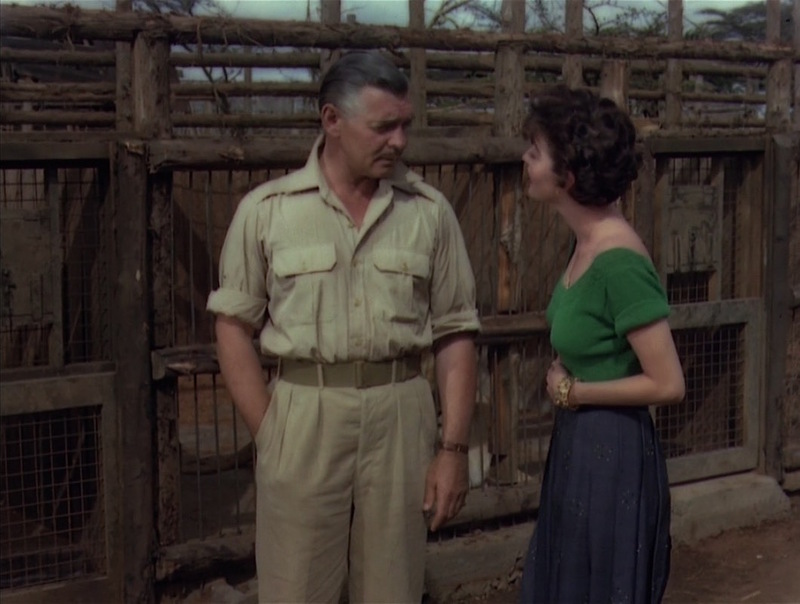 This vest makes its most prominent appearance toward the end of the safari during Victor’s sincere conversation with Donald that reveals Victor’s own guilt about seducing the young man’s wife. He removes the vest when he gets back to his tent in time for the climactic shooting. Victor spits some life lessons. The only non-safari-oriented outerwear that Victor Marswell wears is a yellow oilskin rain slicker with a collar and button front that he wears during an inclement evening spent with Eloise Kelly at his camp. Victor’s wears khaki gabardine trousers with a long rise and double forward pleats that allow a full fit through the legs. These trousers have tall, slim belt loops, slightly slanted side pockets, and two back pockets that each close through a button and are placed high, just below the belt line. The bottoms are finished with turn-ups (cuffs). Victor gives Honey Bear Kelly a tour of his grounds. 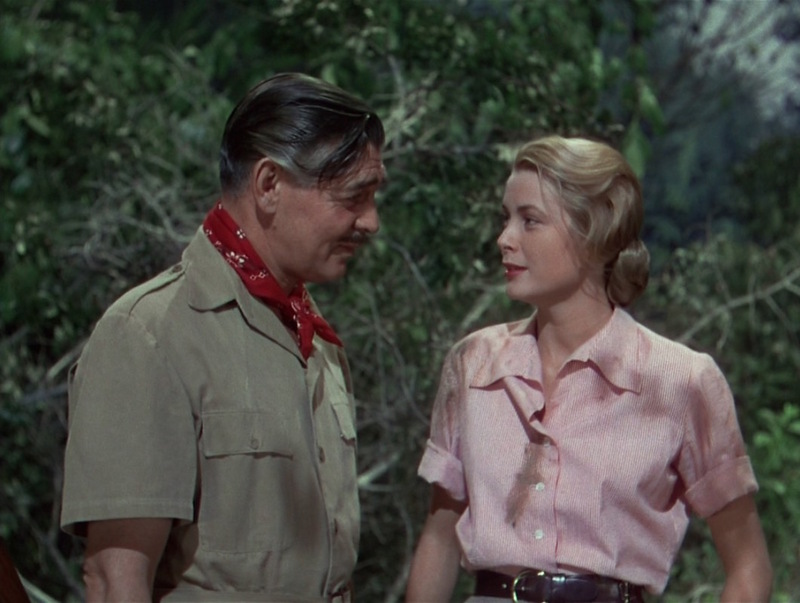 “Well, bless your big, bony knees!” cat-calls Eloise Kelly when she spots Victor wearing shorts with his lightweight bush jacket. The full-fitting, double forward-pleated shorts are styled exactly the same as his slacks with tall, slim belt loops, side pockets, and two highly placed button-through back pockets. Don’t try this at home: advice that applies to both voluntarily being a spear target and wearing high-waisted pleated shorts with no shirt. Victor’s cotton web belt is a slightly darker shade than his clothing, closer to true khaki, with the edges trimmed in brown leather and a tall, slim brass buckle. A carrier with five loops has been attached to the right side of his belt to hold five extra .270 WCF rounds for his rifle. Victor Marswell may have the ammunition on his belt, but his oafish comrade Boltchak (Eric Pohlmann) holds the rifle. Victor switches between two different pairs of light brown suede boots, as he did with his navy polo shirt. For heavier duty days, he wears a pair of rich tobacco brown cap-toe hunting boots that are tightly derby-laced up the front with two adjustable straps cinched up the leg. On other occasions, typically ones that call for him to be wearing shorts, he wears a lighter pair of sand-colored reverse calf ankle boots, also derby-style but with nine eyelets laced up the front and a moc-toe. His hosiery includes tall beige socks or gray leg-warmers, depending on the situation. Victor Marswell shares some of his hard-learned wisdom. Victor lights a Camel using the traditional match rather than part of his campfire. 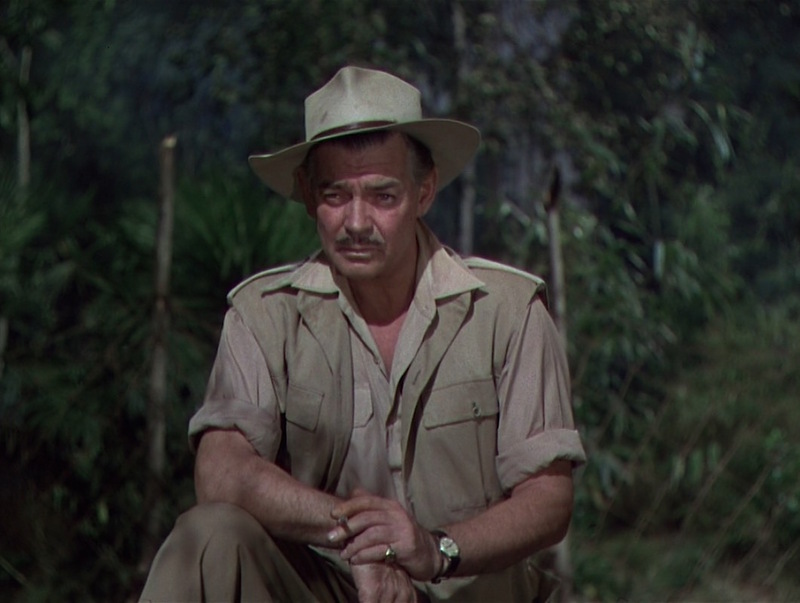 Clark Gable wore his personal timepiece in Mogambo, a 14-karat yellow gold Rolex Oyster Perpetual, ref. 6011. This wristwatch with its faded off-white matte dial and textured black leather strap was included in a 2013 auction of other Hollywood memorabilia. Also on his left wrist is a slim brown woven leather corded bracelet. For late, romantic evenings with sassy vagabond showgirls like Honey Bear Kelly, Victor Marswell knows he can’t go wrong with the classic highball: merely a shot or two of booze topped up with soda, ginger ale, or plain water. Victor: Kelly, you’re all right. How about a drink? Kelly: Oh, I’d love one! Victor: Sorry about no ice. Kelly: Oh, that’s alright. Doctors say it’s bad for your pouch, anyway. Victor Marswell, “the original African hot rod,” serves some late night highballs. Many drinks and a long, dramatic safari later, Victor returns to his tent to drown his sorrows after deciding to not get in the way of the young Nordley couple’s happiness. He grabs an iron mug, a bottle of Hennessy Three Star, and begins pouring. 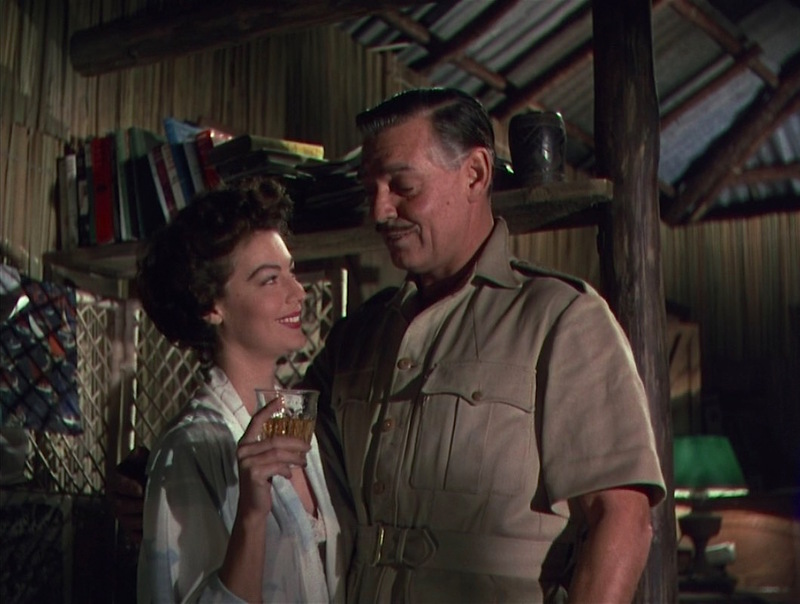 A 1950s bottle of Hennessy Three Star, similar to what Clark Gable would have poured himself as Victor Marswell in Mogambo (1953). County Cork-born officer Richard Hennessy had become familiar with the Charente region of Cognac, France, during his service with the French Army’s Irish Brigade. In 1765, Hennessy opened a cognac distillery in the region and quickly capitalized on the increased demand for cognac and other spirits imported from the European continent. More than 250 years after the distillery was founded, Hennessy enjoys a status as the world’s largest cognac producer with more than 50 million bottles sold each year and a connotation as a luxury brand with hip-hop associations. Exactly 100 years after the distillery was founded, the founder’s great-grandson Maurice Hennessy introduced the star classification system including Hennessy Three Star, now known as Hennessy V.S., the world’s most popular cognac. The V.S. appellation, meaning “Very Special”, can be confusing for novice cognac drinkers, as it merely refers to the minimum age of a cognac and thus the least expensive variety. 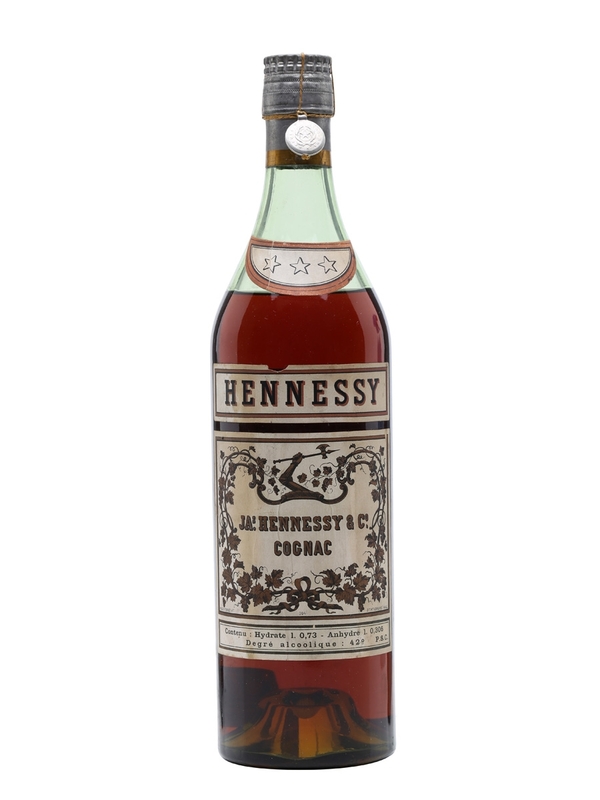 Interestingly, Hennessy Three Star cognac was also Clark Gable’s liquor of choice in the original 1932 version, Red Dust! Seeing double? 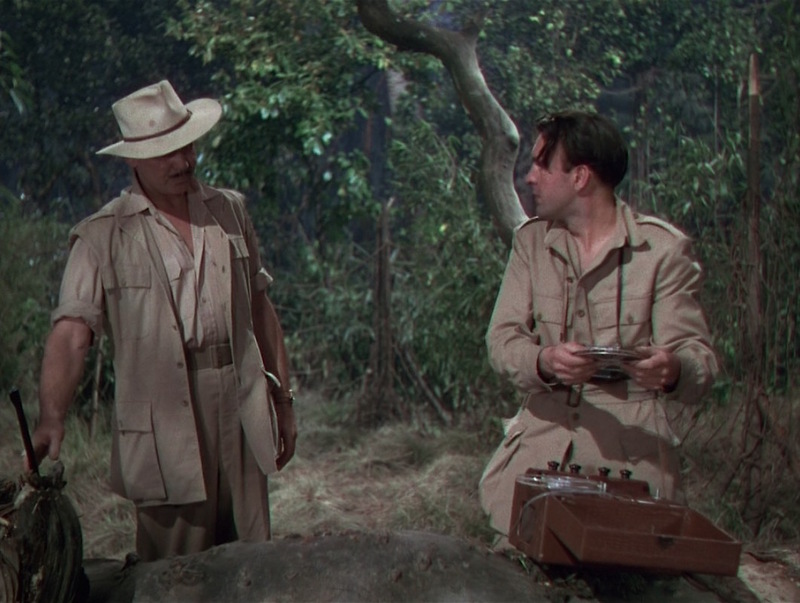 Gable’s Dennis Carson (in Red Dust) and Victor Marswell (in Mogambo) both rely on Hennessy in their times of need. As an experienced hunter, the primary tool of Victor Marswell’s trade is a classic Winchester Model 70 bolt-action rifle. Included in an auction of Clark Gable-related items in 2011, the firearm was described to have been made in 1949 and chambered in .270 Winchester Center Fire (WCF). 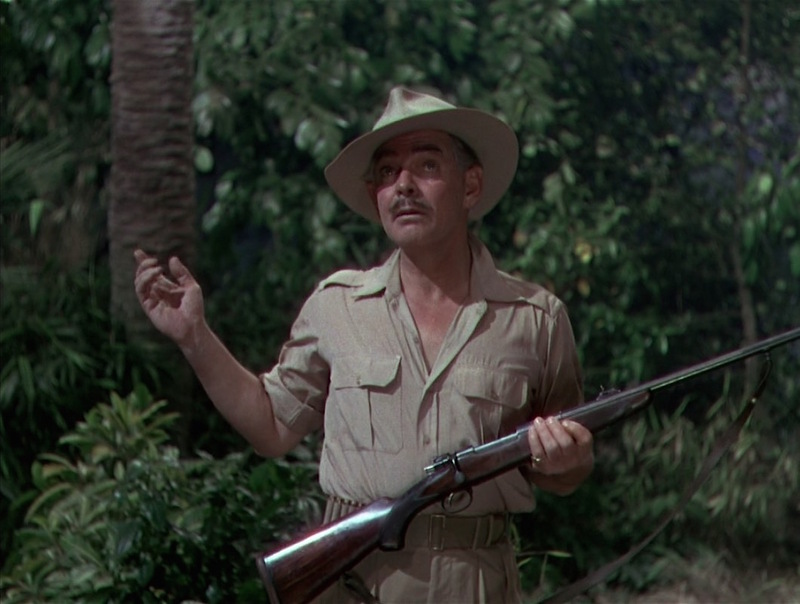 Clark Gable’s screen-used Winchester Model 70. Source: DearMrGable.com. Since its introduction in 1936, the bolt-action Winchester Model 70 has earned renown among sportsmen and serious shooters as “the rifleman’s rifle” for its quality, reliability, and classic aesthetic. Winchester redesigned the rifle in 1964, some say to its detriment, but the Model 70 still reigned supreme when Gable’s Victor Marswell carried his on safari in Mogambo. Stepping back a few decades, it was in 1925 that Winchester unveiled its new .270 Winchester rifle cartridge, a necked-down .30-06 Springfield, as a chambering for its bolt-action Model 54, a predecessor of the Model 70. The high-performing 130-grain round was determined to be suitable for big game in addition to lighter bullets (100-grain) marketed for varmint hunting and heavier rounds (150-grain) offered for larger game like bears, deer, elk, and moose. However, it took nearly 20 years for the cartridge to truly attain its modern reputation. By the time Mogambo was released, O’Connor was writing about his exploits with his custom Model 70 in .270 Winchester for Outdoor Life magazine, describing his exploits taking his “No. 1” rifle hunting for elk in Wyoming, for blackbuck in India, and for red sheep and ibex in Iran. Thanks to popular writers like O’Connor, the .270 WCF overcame its pre-WWII stagnation and has proven its staying power through generations of hunters. 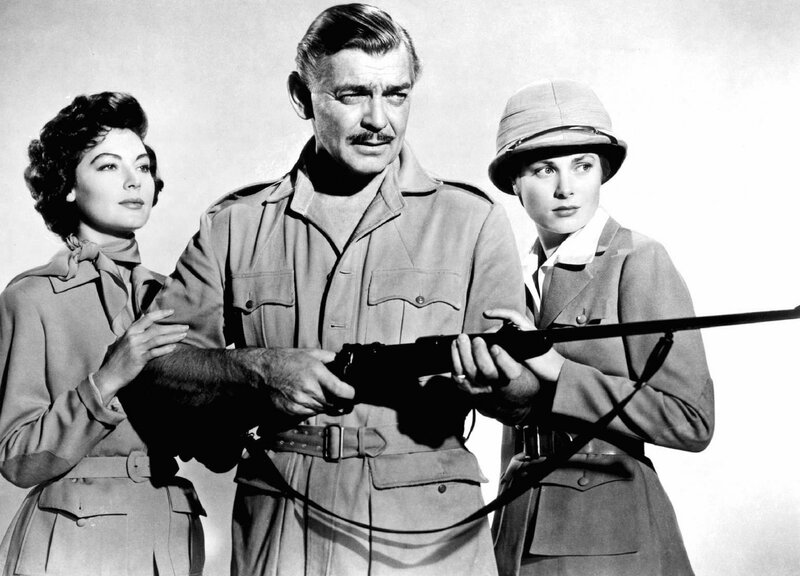 Once the safari has commenced, Victor also gives Eloise Kelly a loaded Webley revolver, a Chekhov’s gun of sorts that will factor into the film’s climactic finale. 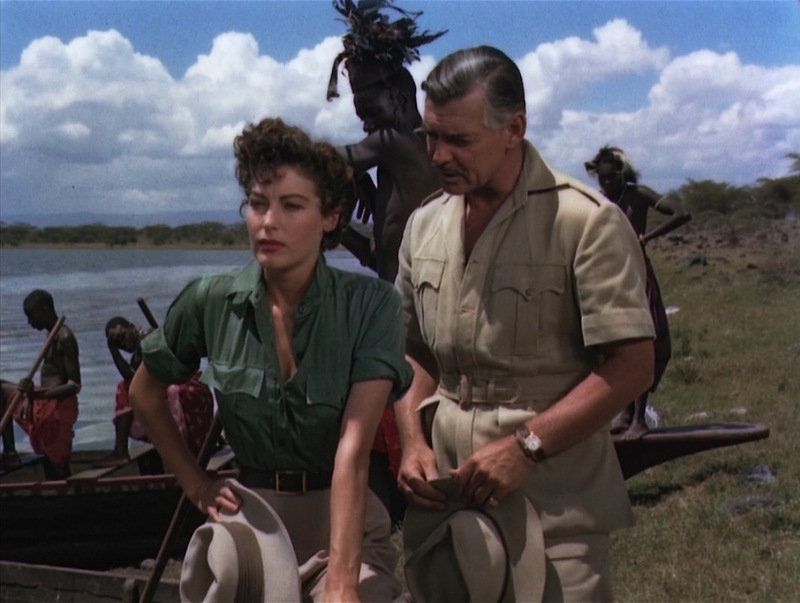 There’s truly no place like an actual safari to wear safari clothing. 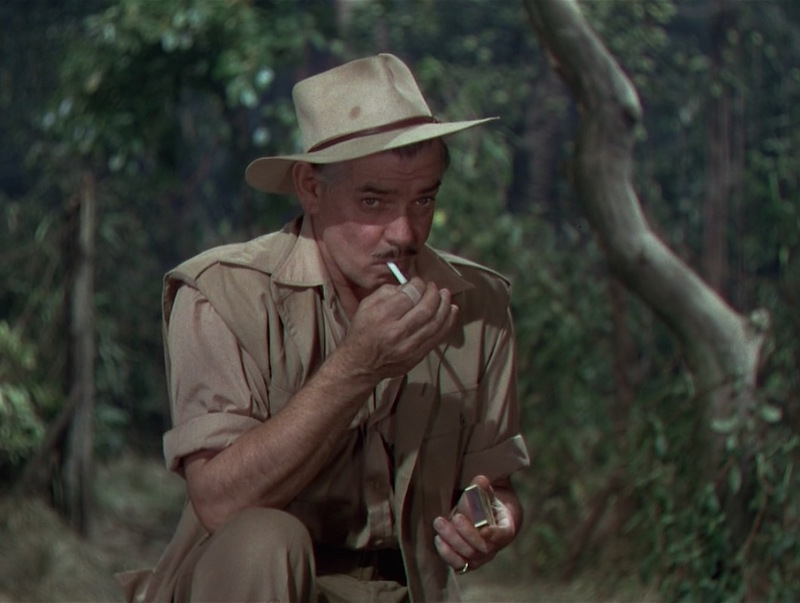 Clark Gable’s choice of Huntsman for the hunting season in Mogambo delivers a classic pedigree to his functional sportswear. Check out the movie, and also treat yourself to the original 1932 version, Red Dust. I make my contribution to this mixed-up community they call the world. Love the blog. I follow and read as much as I can. Gable appears to have 2 different rifles in the pictures above. The first, with the sling attached to the forend, indeed appears to be a model 70. The second, with the sling attached to the barrel, is a rifle built on a Mauser action.